What is money, where does it come from and more importantly where does it go? At first glance, it might appear inexplicable and bizarre that our governments and our rulers have managed to keep their stronghold over the monetary system for 2000 years, especially when one thinks about the countless ways in which they abused that power and used their monopoly to the detriment of their own citizens. It was a mass delusion that facilitated this, a blind belief that they, and they alone, can be trusted with this vital task while looking out for our best interests as well. However, now, as mistrust against our rulers is justifiably deepening, it is becoming increasingly clear that only we as individuals can ensure our best interests and it is only a matter of time before the entire ill-founded edifice comes crumbling down. To answer all these questions about money, we need to first understand its history — keeping in mind that those who don’t know history are condemned to repeat it. Everything started when people settled down and instead of living off nature they started adding value to it; this was the beginning of private property rights. In addition, men started to realize that some people are better at performing specific duties than others and thus set into motion what we today understand as the division of labor. This increased economic output and in general terms, everyone became better off. This transition in how work was performed in an economy made trade between individuals a necessity. Thus barter, or the exchange of real goods and services against other real goods and services, became commonplace. Barter also had its disadvantages, because it required what is known as a “double coincidence of wants” in order to function. For example, to be able to trade your cow for three goats in a barter economy, you must first find someone who wants a cow, has three goats and is willing to exchange them with your cow. The concept of money, however, frees all the market participants from this burden and eliminates such inefficiencies; it offers the possibility to use a commodity, or more precisely, a hard asset of widely recognized and accepted value, that serves “to fill the gap” of non-coinciding wants. Throughout human history, many different things have served as money, from cattle and tobacco leaves to seashells and trade beads. Even today, we use words that originate from these times and derive from Latin, such as “salary”, that comes from salt, which was used as a medium of payment of soldiers during the Roman Empire. 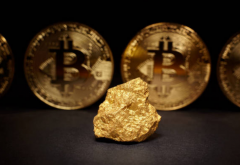 However, over thousands of years, precious metals, and especially gold and silver, have emerged as the best form of money, with gold eventually prevailing in the market. Gold was therefore chosen organically and as a result of a decentralized, natural selection process. Why? Because people valued gold for its own sake even before it became money. Therefore, real money doesn’t come into existence by force or legislation. It is, in essence, a market process, where participants decide freely which medium of exchange they want to use. Gold and silver were easily recognizable and transportable, they were rare and therefore fulfilling the function of a store of value free of any counterparty risks. People today, especially in the west, have forgotten that paper money used to be a mere property title for a certain amount of gold or silver. Even in the past, it wasn’t considered wise to walk around with too many gold or silver coins, so people started to deposit their gold with the goldsmith, who in return demanded a storage fee for safekeeping. The depositors were still the owners and the gold couldn’t be lent out, while they received a receipt for their deposits. Over time, these receipts became a means of payment themselves, as they were a title of ownership on gold and thus “as good as gold”. This development gave birth to the modern banking system and the dematerialization of money. Greed, however, took over, and the goldsmiths wanted to make more money. Actually, the first documented case of fraud by a “banker” dates back to the year 393 BC. Isocrates describes in a speech how the banker “Passio” used bribes, deceived and falsified documents to misappropriate the gold which was entrusted to his “bank”. It became a widely used practice of these goldsmiths (and other depositories) to lend out the gold which was handed to them for safekeeping; earning interest on lending out gold in the form of receipts; which wasn’t legally theirs. As the receipts were perceived to be as good as gold, by increasing the amount of receipts, they actually created money out of thin air and were earning interest on it. This Ponzi scheme worked well as long as the people had confidence in the bank and didn’t all demand to retrieve their gold at the same time. The population is thus automatically divided into a few winners and many more losers. Organizations and institutions closer to the new money production, to the government and central banks, receive the newly created money first and thus can buy at existing price levels before they increase to the detriment of everyone else, who can do nothing but watch as their savings gradually corrode and lose purchasing power. We will never be able to prevent inflation unless we take away from the government the monopoly on spending money. Governments have never given us good money, yes, the rationale for governments’ monopoly on spending money was not even that they would give us good money, but only those who needed it for funding purposes. The result was that for two thousand years we had a monopoly that nobody questioned. So, if we want to maintain a free society, we have to rebuild democracy and take the money monopoly on the government. Today, we are standing at the precipice of such a revolution. Much like the paradigm shift and massively disruptive effects of the internet in the 90s, blockchain applications and cryptocurrencies have the potential to break and rebuild the current system. Decentralized communication, decentralized law, decentralized production and a decentralized financial system can allow us to reclaim control and bring all the abuses of power by centralized institutions to an end. In such a blockchain-based, decentralized “non-system”, real assets can be digitalized and every person can decide for themselves what they want to use as money. A property title on physical gold, silver, or other commodities, real estate or stocks of companies operating in the real world will be traded as well. Just imagine the world as a global, connected, but totally decentralized and truly free marketplace. The allocation of resources will be optimized, human talent will be put to much better use than today, innovation will blossom, while the total freedom to trade with whomever one pleases, without barriers and in any form of currency they choose, will bring down costs, cut out all middlemen and intermediaries, and eliminate all burdens and limitations imposed by the state. If you think it sounds like the distant future, think again. Fintech startups and blockchain projects are already working hard on this around the world, especially in key crypto-hubs such as Switzerland and Liechtenstein. Of course, it would be foolish to believe that the transition to this new world will be completely smooth and without challenges. However, at the end of the day, we have to decide whether we want to live in a system that enforces and limits our choices when it comes to what kind of money we get to use, or if we want to reclaim the right to make our own decisions.